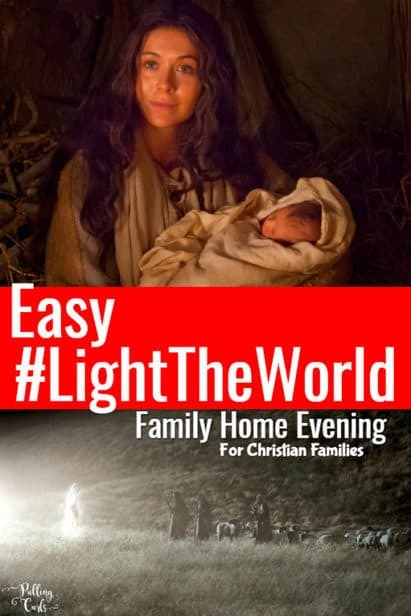 I was really wanting to do a Family Home Evening to introduce #lighttheWorld this year for Christmas. Each week has such good themes, but I think there is something to darkness, that I really wanted my kids to understand. Honestly, my kids and most people don’t experience darkness all that much. I have a daughter who won’t let us shut her door at night because she hates being in the dark (and no amount of night lights seems to help this). So, here’s my family home evening plan that is really simple, but seemed to impact my kids and remind them a few things about bringing light to the world. Sidenote: The Church of Jesus Christ of Latter-Day Saints encourages us to do one evening a week together as a family where we talk about gospel topics and how to be good people. They also do a Christmas initiative called #LightTheWorld where we work to bring light into the world. It is one of my most favorite things about the Christmas season. First, turn off all the lights (btw, I texted my husband to let him know about this in advance, so he didn’t think I’d gone crazy). Of course, I didn’t turn off ALL the lights. But I tried. We still had some electronics blinking, but since it’s winter it was still quite dark. Then, start family home evening as usual. I had to stop kids from turning on lights 3 or 4 times, and they were unamused with me (for reference my kids are ages 14 and 9 — we also have a college kid who doesn’t live at home). We sang (my daughter rushed to a window so she could use the light from outside to help her read the hymnbook, even though she knew the words. Then, I just started to ask them some questions about darkness — and I asked them to remember some times we’ve been in caves in total darkness. What don’t you like about darkness? It seems sort of claustrophobic, even though the room isn’t any smaller. They felt relieved and happy to be out of the darkness. It is easy to turn on a light, and it’s easy to share your light with others. I also reminded them of Mr. Kruger’s Christmas where the little girl shares her light, just by happy and friendly. I think it is REALLY important for kids to know that they can share light at Christmas just by being friendly and happy. A lot of people find joy in children at Christmas, and if they don’t have kids of their own — other children can bring them a lot of light at this time (I talk about that more in my Christmas sharing time). While I absolutely LOVE the church’s initiative, I think it was important for kids to understand what type of darkness some people live in day to day — and how we can each work to bring light to them. People just having hard times — like we all do. Then, I showed this video — because I think it reminds us how warm and happy the Savior’s light is in our hearts. And then we sang, prayed and ate cookies.